Water access for tens of thousands of internally displaced persons (IDPs) in Myanmar’s western Rakhine State could worsen after the dry season begins in November, with potentially serious health implications, aid agencies warn. “The IDP population that relies on water from ponds will [be affected] as [water supplies] progressively dry up. In other locations, hand dug wells or boreholes will also dry up,” Olivier Le Guillon, water, sanitation and hygiene (WASH) cluster coordinator for the UN Children’s Fund (UNICEF) in Yangon, told IRIN. Myint Oo, senior programme coordinator for Relief International, said the water shortages could lead to cases of acute watery diarrhoea (AWD) and dysentery, both amoebic and bacillary. Drinking contaminated water can cause skin infections, along with other infectious diseases of the alimentary system transmitted via the faecal-oral route, such as hepatitis A, he warned. 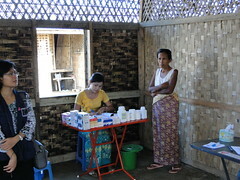 “Alimentary system infections caused by acute water shortages in the dry season are equally important issues for non-IDP populations in Rakhine State, especially in rural and remote areas,” Myint Oo explained. WASH data from June found that 40 percent of IDPs access water from ponds, while 28 percent are using treated water, and 7 percent of those in camps have insufficient access to water, the Rakhine Response Plan reported. Who will be worst hit? Most IDPs are Rohingya Muslims in and around Rakhine’s capital, Sittwe, while those camps outside Sittwe are in low-lying coastal areas accessible only by boat. During the dry season, which runs from November to May, access to water will be particularly difficult for those displaced in isolated villages and communities, such as Pauktaw and Myebon, with limited or no access to basic services. “The WASH response in the more remote camps of Pauktaw and Myebon is a challenging undertaking and the longer IDPs stay in the camps, many of which are on sites not suitable for large numbers of people, the more difficult it will be to maintain standards,” Hawkins said. Relief International is currently partnering with UNICEF in Myebon Township to renovate ponds, which involves elevating the perimeters of ponds to prevent dirty water draining in. During the dry season, the only source of water for domestic use is from ponds, as supplies of rain water in catchment tanks run out. UNICEF is planning to lead a survey by the national WASH cluster in 2014, which will aim to better evaluate the potential of spring catchments. Discussions are also in progress about undertaking a geophysics survey, Guillon said. “A better understanding of the hydro-geological environment should be developed in order to identify the possibility of drilling boreholes,” said Guillon. Mapping the location of water sources, “long houses” (made of bamboo and housing up to eight families in eight rooms), latrines and bathing cubicles (a tank of water and a bucket surrounded by plastic sheeting), will enable aid workers to better monitor and address WASH concerns overall, Hawkins said. “WASH activities need to be scaled up and dramatically improved by all aid agencies and government partners working in Rakhine,” she added. According to the UN Office for the Coordination of Humanitarian Affairs (OCHA), more than 176,000 people are in need following two bouts of inter-communal violence between Buddhist ethnic Rakhine and Muslim Rohingyas in June and October 2012, which left 167 people dead and more than 10,000 homes and buildings destroyed. Last year aid agencies chlorinated the water in ponds. However, in some instances water quality levels were too low, forcing aid workers to truck water in, and in some cases even bring in bottled water.